Home News Growther Oil By Beardfarmer.com - Get The Facts! Growther Oil By Beardfarmer.com - Get The Facts! Chances are you have seen us at beard events, at stores on the shelf or a friend told you about how great this oil is. We are in fact the inventors and manufacturer of Growther oil. It is by far the world's number one beard enhancement topical oil. So let's dig into some core facts and information about Growther oil. Growther oil was invented in Ypsilanti, Michigan with the sole purpose of enhancing beards. Our company has been researching and trying hundreds of safe all natural ingredients to help stimulate beard growth. We came up with a few combinations throughout our research and sent them out to be reviewed by non compensated users. The results were as expected. 95% of users saw gains within 3 weeks of use. These results have remained steady through out the years and have helped many bearded folks get that boost they need to have the perfect looking beard. Our product is natural and high quality. We sourced the TOP local cold pressed oils all over the USA. Your beard will be the softest and greatest you have ever had. We have tens of thousands of users across the world that have had great success with our Growther Oil. You can see some of the reviews online and directly on our site located here Growther Reviews. Yes, when used as direct you will see that this all natural product is very safe. As with any cosmetic product you should always do a skin patch test before use. We do recommend using a small amount at first to make sure you enjoy it and as you become adapted you can use higher amounts. Tri-blends of carrier oils, Multiblend of pure cold pressed essential oils, and 3 conditioner oils. Please see our Beard Growth Label page for exact ingredients. How long will it take to see beard gains? Nearly all positive users see results within 3 full weeks of use.This is daily use for at least 21 days. Some have reported sooner but our 95% average is a direct result of 21 days of use. What is the difference between Growther XT oil and Growther Oil? The main difference is the added benefit of key amino building blocks. It's more expensive because it costs us more to make it. We recommend all users to try the original Beard Growther Oil before using the XT to make sure it works for you as each XT bottle has to be certified by a lab tech. 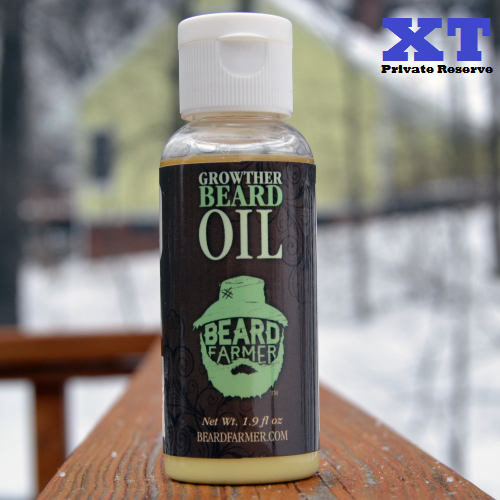 XT is the superior version and currently is only available in our Beard Grower's Gift Pack. The benefit of trying the original first is making sure it's a good fit for you before spending the money on the expanded version. Can I use this on my head? We advise facial hair only despite reviews trying to use this product for many different purposes. This product is meant for facial external use only. Is this a hair loss treatment? This should not be treated as a product to cure, treat or prevent any disease. You will need to discuss treatment with a licensed professional doctor of your country. These are just some common questions users ask about beard growing products and our Growther oil. You can find more questions and answers at our Beard Growing FAQ. If you can't find answer e-mail us questions@beardfarmer.com and we will respond with 24 hours (normally only 2-3 hours) you can also Call (856) 477-3889.